Yes, it’s another peanut butter recipe, but can we really have too many of them? I think not! This is another delicious little cheesecake that was inspired by my last trip to Cheesecake Factory with my family last week. We all got a different slice of cheesecake and sampled each one savoring each and every bite. With all of their candy bar cheesecakes showcased so nicely for all to see, I couldn’t help but make one of my own. So here you have it, little bites of heaven! Take a peek and make some for yourself! If I haven’t sold you on the mini cheesecake pan from William Sonoma yet, go get one so you can make these! Absolutely worth the $30, I use it all the time. Enjoy. 1. Preheat oven to 350 degrees F. Place cookie crumbs, sugar, butter and salt into a bowl; mix to combine. Spoon mixture into bottoms of mini cheese cake pan or mini cupcake pan and press. Bake for 10 minutes and remove from oven. 2. Reduce heat to 300 degrees F. In a stand or electric mixer, beat cream cheese and peanut butter until smooth. Beat sugar, egg, cream and salt until well combined. Slowly stir in crushed Butterfinger. Evenly pour batter over baked crust. Bake for 20-22 minutes or until cheesecake is set. Let cool for 2 hours, then remove from pan. 3. Melt chocolate chips in microwave in 30 second intervals until smooth. Stir in cream until smooth and glossy. If needed, return back to microwave for 15 seconds or so until smooth. 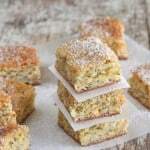 Spoon over tops of cakes then sprinkle crushed butterfinger over top. Have a great week, I’ll catch you soon with a tempting soup that won’t keep you in the kitchen all day. Stay tuned! My husband loves butterfingers and these mini’s look fantastic! Definately bookmarking this one for when he comes home! They look so good…and would you believe I got a mini cheesecake pan at a yard sale for $2.00? Looks like I’m just gonna have to give these a whirl! These look great. And for some reason mini desserts always taste better than full size ones! These are complete and utter decadence. I think making them mini makes one feel less guily because they are small a cute. oh my goodness! you’re killing me with these! no, one can never have enough of pb recipes to flirt with. Those are soooo cute! I know what I’ll be craving all day today. These are gorgeous! I am going to have to make a trip to Williams Sonoma! I am speechless! These are fabulous! These are delicious looking cheesecakes. I also like the fact that you made it in small sizes. These look fabulous!! A wonderful, decadent treat! MMMM these sound good for breakfast! These look amazing. I might have to go pick up one of those mini cheesecake pans! Oh drool! Those look so delectable! I love the combination of peanut butter and chocolate, add in cheesecake and that’s a surefire winner! I love Butterfingers! 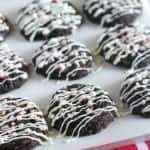 Adding them with more chocolate and some cream is making me drool! I have a mini cheesecake pan and they make the cutest desserts. I can’t wait to try this one. It looks soooo good! Oh wow do those look fantastic! I love Butterfingers also. Great combo. I want to give these a try soon! Mercy. Those look phenomenal! I love Butterfingers and cheesecake is my favorite. Those would probably just kill me, but what a way to go! You can never have enough peanut butter! These look fabulous! You’ve sold me on the mini-cheesecake pan 🙂 They look amazing! yummy! i’ll have to try these for sure! i don’t know how you come up with these fantastic recipes Jenny but boy am I glad you do!!! These are awesome!!! Jenny, you are so good. I haven’t been here in a while but have been feeling a dearth of posts in the food blogs I regularly follow, so here I am! And glad I am, too. Though I probably won’t get the W-S pan (goodness, I have gadgets and gizmos a-plenty), how excellent do those cheesecakes look for parties…of one or more? Also, great site redesign. I aspire to do the same one day! These are the cutest! I love how fancy they look yet so simple to make!! These look scrumptuous. Can’t wait to try them. Wow, these are brilliant!! Jenny, they are calling my name! I love pb and love cheesecake…I have to get that pan! So cute! Gorgeous! I love anything with PB, cream cheese, chocolate. So that’s why I enjoy your blog so much. I love your blog! Feel free to stop by my blog for your awards. Have a great day! Gosh, this is so divine, I love that you linked to the mini cheesecake pan!!! Woohoo!!! You are making me hungry……. We cannot have too many peanut butter recipes, I fully agree. In fact, I don’t think I’ve seen enough yet! You haven’t quite convinced me to buy a mini cheesecake pan but you have convinced me to make these in a muffin tin! These actually aren’t all that unhealthy. No sugar needed in the cheesecake filling? I suppose those Butterfingers are quite sweet enough. Can you please overnight your last three food post items to your hungry pregnant sister??!!! 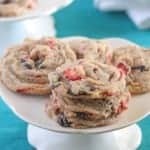 I love any mini dessert – and this is a perfect flavor combination! OMG these look soo good. I must try! Those look awesome. They remind me of a peanut butter bar I made a while back. I love the taste of choc and pb together! Oh my! All that and butterfingers too? My son will think I am “Mom of the Year”. Oh this one is definitely calling my name! I’ll have to talk my husband into buying me the mini cheesecake pan. Thanks for sharing your amazing talent! The peanut butter cheesecake at CF is my absolute favorite! I can’t wait to make these! The older I get I am finally starting to like cheesecake. I’ll have to try this recipe. Looks delicious! How have I lived without your blog?? It’s awesome!! I’m so glad yo are following on my blog. I’m going to shoot you a quick email. Thanks for visiting my page and adding it. I’m so linking up your blog. I’m seriously in love. This recipe looks out of this world. I’m glad Jessica sent you my way. Made these today and didn’t have butterfingers on hand, so i used a couple reese’s cups and kit kats bars that i did have and they turned out SOOOO good. I used a mini muffin pan, which worked well. 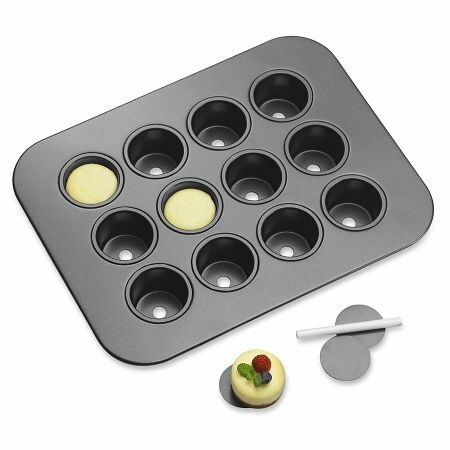 How is a mini cheesecake pan different from a mini muffin pan?